First, thanks again to everyone who has donated money to our fundraiser to keep this map project going. We still haven't reached our goal... (hint hint... donate here) but those of you who have stepped up have allowed us to do some great things, instead of closing our doors this past fall when things got pretty desperate. Thanks also to everyone who has donated their time or talents to this mapping project - interns and volunteers and advisers... each providing data, map knowledge, marketing/design help, advice/encouragement/criticism/discussion, or other resources... we are always looking for people who want to contribute to our mission. Thanks to the staff and leadership at Cabrini Connections and Tutor/Mentor Connection, and to all the volunteers who work with the kids each week. Clearly, your vision and hands-on perseverance provides leadership-by-example for the kids and for myself. 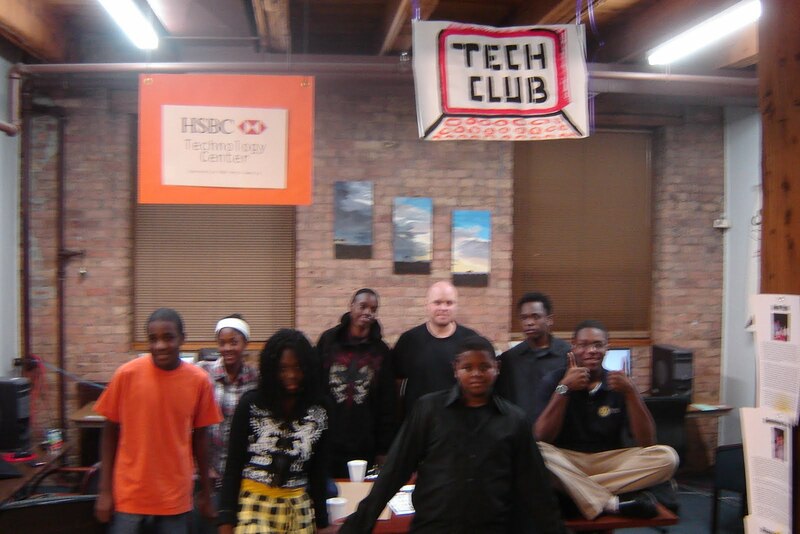 These 7th-9th graders from Cabrini Green and elsewhere in the city have been working this fall to learn marketable tech skills such as graphic design and animation... they will soon be learning to advocate for themselves through maps... we are currently looking for now volunteers to bring their tech expertise to the club once or twice a month on Tuesday nights. Join us! And last but certainly not least, thanks to YOU for coming here and reading each week. I have a few new maps up my sleeve, ready to show off... and some new experiences/surprises to share... see you after Turkey Day! If the Turkey doesn't get you first! 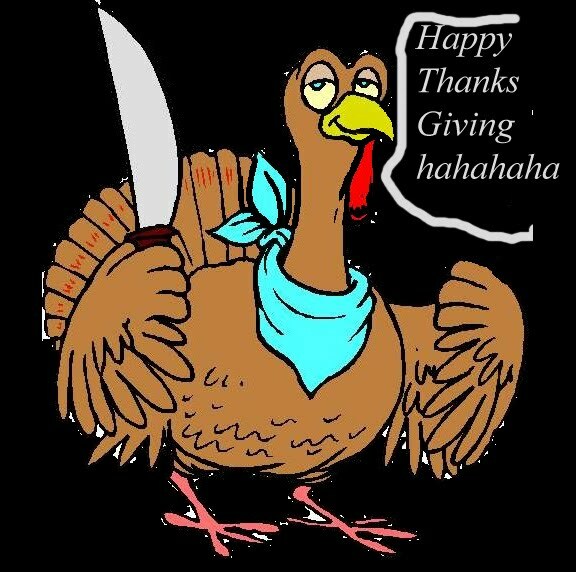 Please have a safe Thanksgiving! 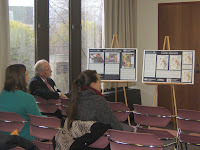 And as always, please contact me with thoughts, comments, concerns, critique, needs... we need more discussion! Due to the kindness and charity of many who understand the importance of our work, we have reached 69% of the $5000 we targeted in our fundraiser to continue Mapping For Justice. This is exciting... but 69% wasn't the goal of course... we're aiming for the whole 100% we need to keep providing non-profit maps and strategies that answer recent calls by politicians and community leaders for better and more mentoring options for at-risk youth. Please help us reach our goal and map for the community into the new year! Political leaders these days are actively calling for programs like ours to facilitate the strategic process that builds new mentor-to career programs, while assisting those that already exist. 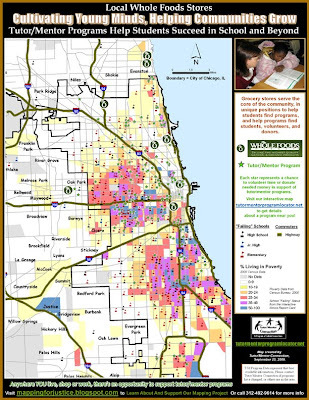 Maps like this second one below show where schools are performing poorly - an indicator that students need might additional tutoring/mentoring to improve their shot at career, financial independence, and reinvestment in community. 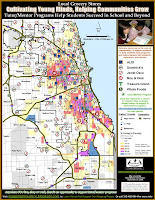 Without 100% of our fundraising goal, the map work that has started to connect Tutor/Mentor Connection's decades of tutor/mentor experience... with the politicians and leaders who are now recognizing tutor/mentor programs as a potential means to alleviate social problems like teen violence, poverty, dropout rates, and workforce-related issues... threatens to end prematurely. What have we accomplished so far, since the fundraiser began? Since the fundraiser started, others concerned with escalating teen violence, poverty, dropout rates, and workforce-related issues have donated anywhere between $5 and $1000 to this fundraiser. We continue to meet new community leaders (such as the director of the Field Museum's security) who invariably meet our mission and work with great enthusiasm, and then try to generate alliances and spread the word to other leaders in their networks. And we have found new supporters who are thinking "outside the box" about ways to raise tutor/mentor visibility, money and volunteers - and ultimately attendance! (Look for an art/map gallery or two that incorporates our maps in the coming year). None of this could have happened if a few of you didn't step up and save us in the past two months. However, again I point out, we are still short of the $5000 we set out to generate with this fundraiser and do not want to be right back where we started in another month. In the spirit of giving this season, please consider a small donation to programs that promise to try and improve our city... through new generations of better prepared workers, students, and decision makers. And please do not hesitate to contact me for more details or with questions! 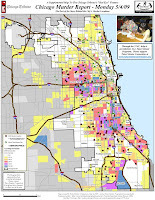 Last week, I began looking at a series of maps that show many of our local grocery store chains, in relation to poverty, "failing schools," known tutor/mentor programs, and highways. 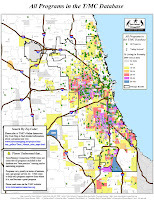 My most recent blog in the series focused on Whole Foods and showed how, even though they have few stores in high-poverty neighborhoods, they have done a lot to help non profit organizations like tutor/mentor programs. 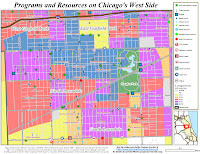 But Whole Foods (click on the map above and to the right to expand it) operates in only a few locations, and while they seem pretty good at pushing support (dollars, volunteers, awareness) from customers of relative affluence toward neighborhoods in need, perhaps other chains have store locations that operate in the higher-poverty neighborhoods themselves, and are in positions to generate support from within the community. 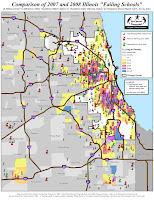 I chose to look at the locations of all Dominick's (Safeway) stores, because I see a lot of those around town. Like Whole Foods, Dominick's has a corporate mission that stresses "responsibility to become involved and to help build better, stronger communities." They mention that, "As part of our ongoing commitment to education, we also support numerous school scholarship funds and youth development foundations, and we sponsor a broad range of after-school and physical education activities." Through support from a corporate office like Dominick's, and with their large army of local store managers, we can work together to make this happen! Because you'll notice that Dominick's has many stores in Chicago - many more than Whole Foods at least. 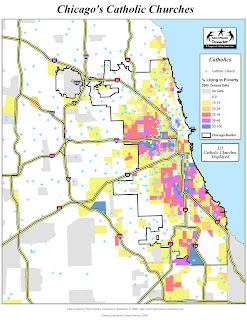 A handful of them even operate within - or at least in closer proximity - to high-poverty neighborhoods (darker colors on the map represent increasing ranges of families living in poverty). 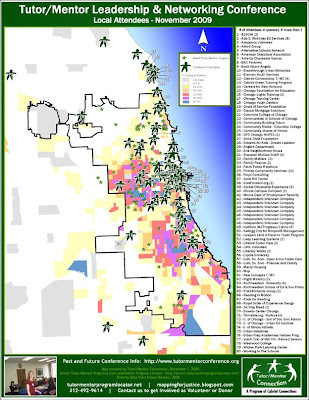 Many of these neighborhoods show high concentrations of "poorly performing schools." Both of these conditions are indicators that there are probably students living there who might need help with homework (tutoring), and potentially with making life decisions that are tied to preparing for college and careers (mentoring). In other words, Dominick's might be in a slightly better position in some ways than Whole Foods, to generate support (dollars, volunteers, awareness) locally for neighboring programs. Local store managers are also in position to raise awareness via community message kiosks or word of mouth. 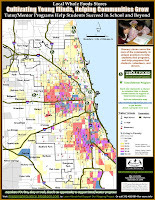 Perhaps they can even take the lead from another community center, Hyde Park Hair Salon, and hang the Dominick's map I made for this posting in their local store locations, along with information for shoppers/parents who want to enroll their children... or perhaps volunteer or donate to programs in their shared community. The sheer number of local stores raises the possibility that individual managers can ally with other Dominick's locations to magnify their efforts as well. 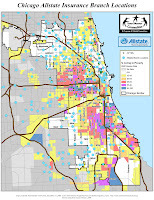 The map shows that this can happen either in communities of need, or from stores that serve the relatively affluent periphery. If Whole Foods was able to raise $5000 from four locations in a few days (see my last blog), just think what Dominick's can do! 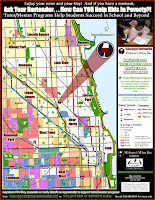 What's more exciting is that, unlike Whole Foods, whose corporate offices operate from outside of Illinois, Dominick's has a headquarters in the Western Suburbs, a quick commute from Chicago and the Chicago Public Schools. 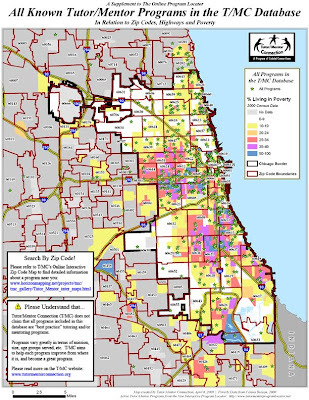 Certainly they have a more intimate "responsibility to become involved and to help build better, stronger communities" in Chicago. Political and media leaders are talking about more and better mentoring programs in the fights against local poverty and crime. Dominick's is in a position of strength to take a lead in making it happen. To date, Dominick's has donated a $50 gift card to our fundraising and strategy efforts this year. I'm not sure what they have contributed to other mentor-to-career programs, but I'm hopeful that together, we can do even more. 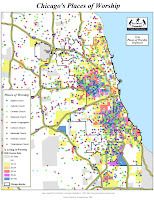 In my posting on Monday, I included a map that showed many of the grocery stores in Chicago, in relation to poverty, "failing schools," known tutor/mentor programs, and highways. 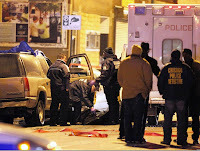 Community Citizenship: We recognize our responsibility to be active participants in our local communities. We give a minimum of 5% of our profits every year to a wide variety of community and non-profit organizations. ...several times a year, our stores hold community giving days (otherwise known as “5% Days”) where five percent of that day’s net sales are donated to a local nonprofit or educational organization. The groups that benefit from these 5% Days are as varied as the communities themselves. In other words, Whole Foods is able to donate a small portion of their sales, from time to time, to non-profits. But a small fundraiser like this does more than just pay rent. There are other less obvious benefits. 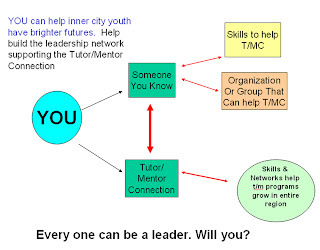 During checkout, the customer is introduced to Tutor/Mentor Connection, or other student-advocacy causes - programs they likely didn't know about before, but might now want to volunteer to assist a couple hours each week, or make a small donation (of money or talent or supplies). Moreover, this simple fundraiser just planted a seed. Perhaps this customer is still not ready to take action. 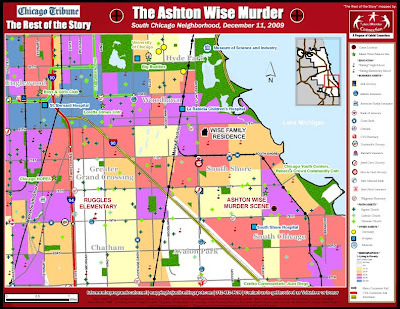 But perhaps while watching the news the following week and hearing a politician discuss "mentoring" as a solution to crime, suddenly this concept has a recognizable face and name for this Chicago resident... 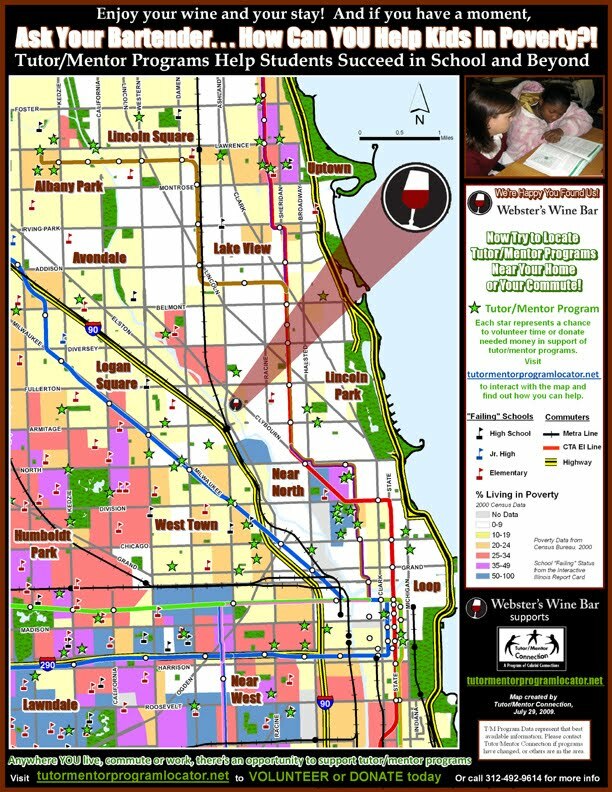 This is taste-making or "buzz" creation... this helps focus discussion, momentum, and action toward solutions to problems that affect our city and our country. 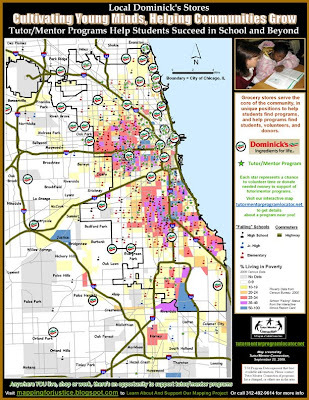 But again, the most immediate thing a cause-mined business like Whole Foods that operates in more affluent neighborhoods can do to help a non profit like Tutor/Mentor Connection, is to raise money that helps non profits pay rent. Whether this involves a corporate donation, a percentage of sales, or leading customers who want to make a contribution to the cause, this is the position of strength in the war against poverty for a company like Whole Foods. And yes, some of Whole Foods' charity HAS come our way. 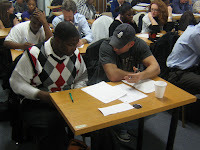 Whole Foods has sponsored Tutor/Mentor Connection, and has helped us raise over $5000 this year alone, through their One Dime at a Time program, whereby "Whole Foods Market gives 10 cents per bag to customers who re-use their own shopping bags for their purchased groceries. This program reduces our impact on the environment and now supports local non profit groups. Customers will have the choice to accept their cash refund, or donate the cash back to the store’s chosen non profit organization. " So to summarize: Here we have an example of a store whose main clientele are not from high-poverty regions, yet understand their particular strength in the war on poverty... raising visibility and money that keeps non profits alive. Come back later this week and I'll focus on a new chain with a new set of strengths. See, while some businesses are in positions to generate corporate or sizable financial support, some have the power to interact locally with parents and community leaders, from locations in the high-poverty neighborhoods themselves. I have to admit... I was somewhat skeptical when Cabrini Connections Research and Networking Coordinator, Nicole, told me over a bunch of Martinis last year (at our Martini Madness Fundraiser event) that she was going to start training to run the Chicago Marathon... with funds raised going to Cabrini Connections and Tutor/Mentor Connection (T/MC). I mean, it was after a bunch of Martinis after all! And look how long the route is! 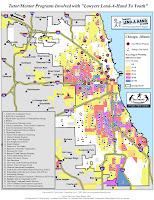 (Click on map to increase size of race route, in relation to poverty, poorly-performing schools, known program locations, and Bank of America (sponsor) Locations. But back to Nicole's story! 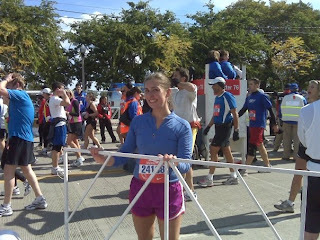 Sure enough, after sobering up, she stuck to a training regimen all year, raised $2,757 for her favorite charity, and then somehow got up at an ungodly early hour last Saturday, to run 26.2 miles through the streets of Chicago... smashing her goal of 5 hours by over 15 minutes. But get this - she's still not done! Take a peek at her blog this week to learn how you can still contribute to her fundraiser, because as she says, "Even though the race is over, we still need to keep Tutor/Mentor Connection running!" 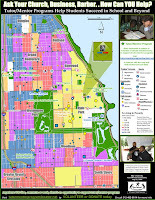 She also discusses a couple other coming events and contests that will help you get involved with our Tutoring/Mentoring cause for Chicago's students. I wrote a series of blogs earlier this year about the Insurance Industry and its potential role in raising support for tutor/mentor programs. Interestingly, when you look at this new map I made of all known grocery stores in the area (below) - again mapped alongside poverty and tutor/mentor locations - you might recognize a similar pattern... a distribution of store locations that is similar to locations of insurance companies. 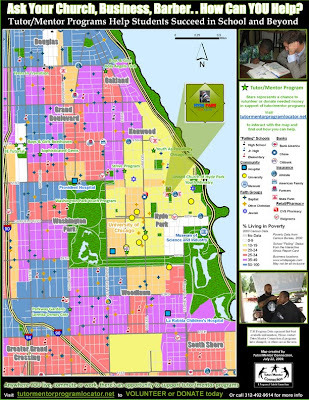 ... in concert, of course, with recent calls from political leaders and media leaders who are seeking ways to provide students in high-poverty/high-crime neighborhoods with the mentoring they need to make better life choices. 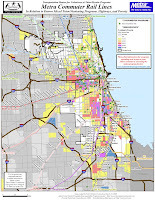 Take a look at this map above, and come back Wednesday for a look at "Local Grocery Stores: Whole Foods ." Special thanks to David Ward, a volunteer and GIS professional, who helped me collect the store locations. 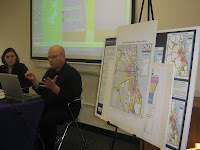 If you want to help us collect data and/or make maps, please contact me - we're non-profit and always looking for help. We're also looking for graphic artists, and other tech-related professionals who want to lend a hand to Mapping For Justice. And our fundraiser to continue Mapping For Justice has raised 70% of our $5000 goal... we've extended it until November 1st, if you want to help us meet our goal, but haven't had a chance yet. Thanks for all your support! FAQ #1: "How do you get the maps to the kids in need?" A friend of mine asked a simple question on Facebook this week that reminded me that sometimes I get caught deep in the complexity of what we are doing with Tutor/Mentor Connections strategies... and forget to summarize or simplify. "Hi Mike, this sounds quite noble. 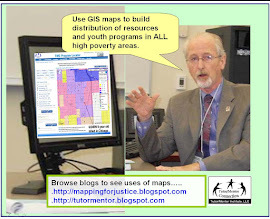 How do you get the maps to the kids in need?" "Hey man... awesome question! Unfortunately a lot of kids probably do not see my maps themselves these days. 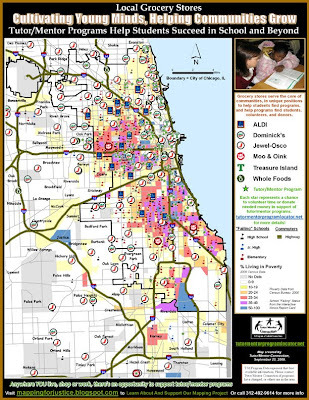 I make some maps to try and raise awareness to the need for tutor/mentor programs (by showing poverty, failing schools, crime, and a lack of tutor/mentor centers). These programs are options to the streets for kids who want to participate in our economy, but simply don't have resources or parents who know what it takes to work toward jobs/college. 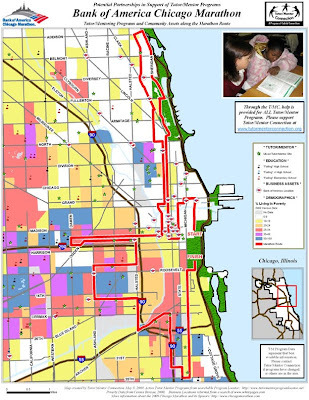 Some of my maps show commuter routes as well, in relation to programs, to try and entice volunteers/commuters to get involved with mentoring... kids need to meet caring professional adults... and adults need to meet kids in these neighborhoods. There is a TON of misconception on both sides of this cultural divide. 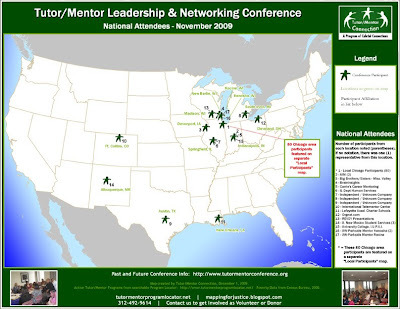 There have been a few success stories from programs that have generated money or volunteers from my maps... there have been some alliances that have formed to help new programs grow... but to this point there isn't enough exposure to my maps or the service they provide. Recently politicians are calling for service and mentorship as a way to fight crime/poverty longterm... they need to know about our resources. There are indications this might happen. Well, maybe then kids/parent will start to hear about/use the maps to find programs. Too few people know we're here yet."